Green Source DFW director Wendel Withrow, left, congratulates first place winner Alberto Trevino at the fifth annual Green Source DFW Run for the Environment on Sunday. Photos by Andrea Ridout. After torrential rain soaked North Texas on Saturday, the sun came out and offset a chilly breeze at the Run for the Environment at Lake Cliff Park on Sunday. Karen Benitez was the first female to cross the finish line. 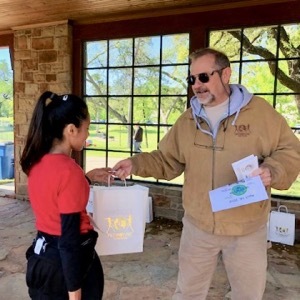 The fifth annual event, benefiting Green Source DFW, launched Oak Cliff Earth Day at 9:30 a.m.
“The weather was perfect and a dedicated group of runners and walkers helped kick off Oak Cliff Earth Day with fun and fitness,” said Wendel Withrow, director of Green Source DFW. Both the green fest and the run are hosted by the Memnosyne Institute, the parent nonprofit of Green Source DFW, an online publication covering environmental news in North Texas, and as well as Food Source DFW, an organization that helps distributers move surplus food to those in need. 43-year-old Alberto Trevino crossed the finish line first with a time of 21:12. Jace Jenkins, 44, followed at 21:29. Karen Benitez, 12, was the first female in, with a time of 25:33. Katherine Mercer, 29, followed as the second place female at 32:17.